Nothing ties a room together quite like the ornate woven and knotted rugs that have their origins in Asia and the Middle East. Intricate designs, bold yet elegant colors and the finest yarns make these pieces some of the most coveted in the world. Here are four quick facts from their history. 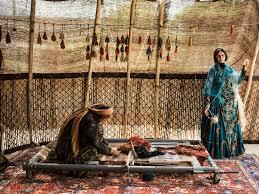 One of the oldest Persian rugs, the Pazyryk carpet, dates back to 400 B.C. and features motifs of elk, deer and warriors on horseback. Cotton, silk and wool are all common materials used to make Persian and Oriental rugs, and many antique pieces incorporate camel hair. Traditional rugs originate from a region known as “The Rug Belt”, which extends across North Africa and Morocco into the Middle East, India and Central Asia. In 2013 the Corcoran Gallery of Art auctioned off a 17th century Kirman rug, known as the Clark Sickle-Leaf Carpet, for 7.5 million euro, or about 9.6 million American dollars. A quality handmade rug might take artisans anywhere from a few months to many years to complete depending on the number of weavers required, the type of materials used, knot count and intricacy of design. From reweaving small worn areas to providing deep cleaning for whole rugs and restoring heirloom pieces, your local oriental carpet specialist should be able to help you bring new life to your own priceless piece of history.